by Shane Claiborne, Jonathan Wilson-Hartgrove, and others. Zondervan, 2010. 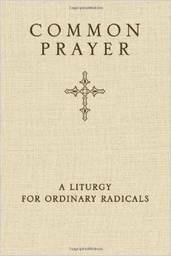 This is a collection of prayers and other liturgical texts. It is eclectic in nature. Offerings come from a wide variety of Christian traditions. It is the intention of the authors to offer resources for a truly common prayer experience, both in terms of daily prayer disciplines and the worship of the entire community on the Lord’s Day. The authors state, “Folks are bound to ask if this prayer book is for Catholics or for Protestants. Our answer is, ‘Yes, it is.’ We want the fire of the Pentecostals, the imagination of the Mennonites, the Lutheran’s love of Scripture, the Benedictines’ discipline…” Almost all the entries can be adapted for use on the Lord’s Day. The book features articles on various prayer topics. Biographical sketches of Christian notables provide a sense of praying with the saints. The book ends with a series of choruses that are to be incorporated into the daily prayer experience.